As a nutrition entrepreneur, saying I have a lot on my plate would be an understatement. 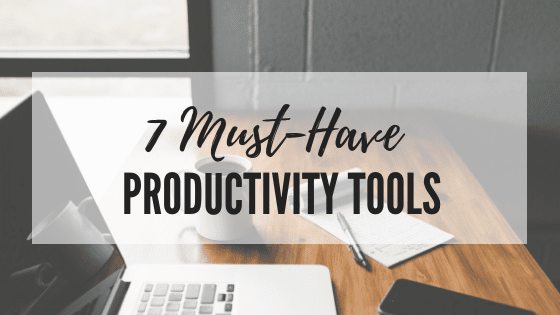 Over the past few years, I’ve relied on several different tools to keep me focused, efficient, and productive. 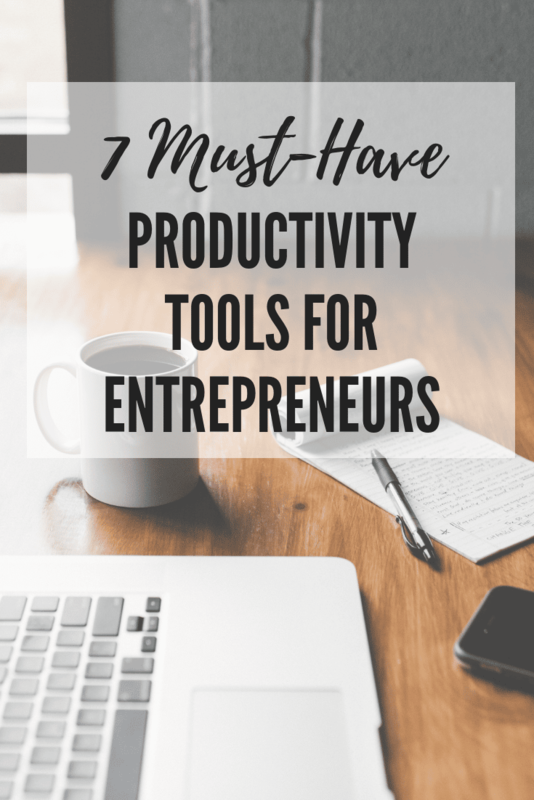 If you’re looking for ways to better focus and produce more work, in less time, try one of these seven productivity tools for entrepreneurs. This blog post is sponsored by Cognizin® Citicoline, meaning I was compensated for my time, but as always, all thoughts and opinions are my own. As a solo entrepreneur, I am not only the CEO but also the sales team, product department, tech, customer support, operations…even the janitor! For example, this week I saw 15 private clients, recorded webinars for an online course, dealt with tech issues from said course, wrote sales emails, built a new webpage, filmed a TV interview, responded to questions in a private Facebook group, spoke on a panel, hosted a live online Q&A, met with an advisory board I’m a member of…and did I mention it’s only Wednesday? At all times I am juggling multiple different projects, along with a rather busy social and travel life, all of which require 100% of my focus and max productivity (so that I’m not spending ALL my time working!). This is totally the norm nowadays – the reality is we live in an extremely fast-paced world and many of us have an extremely high-demand lifestyle. When I first started out as an entrepreneur, I worked an insane amount of hours. Now part of that comes with the territory, but I also suffered from lack of focus and low productivity. I was working a ton of hours each week but had little to show for it. Over the past few years, I’ve come to rely on multiple tools to keep me focused and help me work more efficiently, allowing me to produce more, with less time. I now almost exclusively use Google Drive to hold all of my files and documents. Not only does it save me the fear of losing everything with a computer crash, but it also means I can access all my files anytime, anywhere, from any device – including my phone. This has been a lifesaver at times when I’m out and about without computer access and need to find or send a file. Google Drive also makes it easy to share and edit files. Now that I have several interns working with me, it allows us to have living, breathing documents. All edits are tracked, plus there is a chat feature and a notes option right within a document. I mainly use Google Docs and Google Sheets, but you can also make forms, slide presentations, and more. Everyone is familiar with the annoying hassle of emailing back and forth to set up a meeting time. Tomorrow at 2pm? No? How about Thursday at 11? No? Ok what about next week? Next month? Acuity Scheduling was a game-changer for me when it came to managing my schedule. I put off using a scheduling system for years because I’m Type A when it comes to retaining control over my calendar. But the beauty of Acuity is I can set different time frames for different appointment types, build in travel time, and make certain rules around lumping meetings together. You also have the ability to ask people to answer questions when they book their call, which serves as a great screening tool. Now, instead of going back and forth with potential clients to see if they’re a good fit – or getting on the phone and wasting 15 minutes before realizing they aren’t – I can know right away when they book their call and then refer them to someone else. My name is Alissa, and I am an email addict. I check my email at least two to three times per hour (often more). It is the bane of my existence and while I know how unproductive it makes me, I can never seem to stop checking it! Inbox Pause is a free Gmail extension that stops new emails from coming into your inbox until you turn it off. That means I can go to my inbox to refer to an email without being inundated (and distracted) by all the new messages. You can also set up batch delivery so that emails only come in during your set work hours – a great way to force yourself to take a break during the evenings or weekends. By minimizing the amount of time I spend reading new emails that, more often than not, are non-urgent, my productivity goes up and my stress level goes down. Not bad for a free app! I’m not a huge supplement person, as I find that most people can get what they need through food. There are a few exceptions, including citicoline – a nutrient that is critical for healthy brain function. The best sources of citicoline are liver and brain which, unsurprisingly, are not widely consumed in the US (not sure about you, but despite being an avid foodie, liver and brain have never been at the top of my ‘must try’ list!). Some citicoline can be made from choline, which is found in beef and eggs, but not enough for brain benefits. To support my mental energy, focus and attention, I rely on CognizinⓇ Citicoline, a clinically tested form of citicoline that has been shown to help support attention, focus, and overall brain function. Cognizin® citicoline helps the body generate important types of molecules that protect and keep your brain’s energy and communication centers running properly. 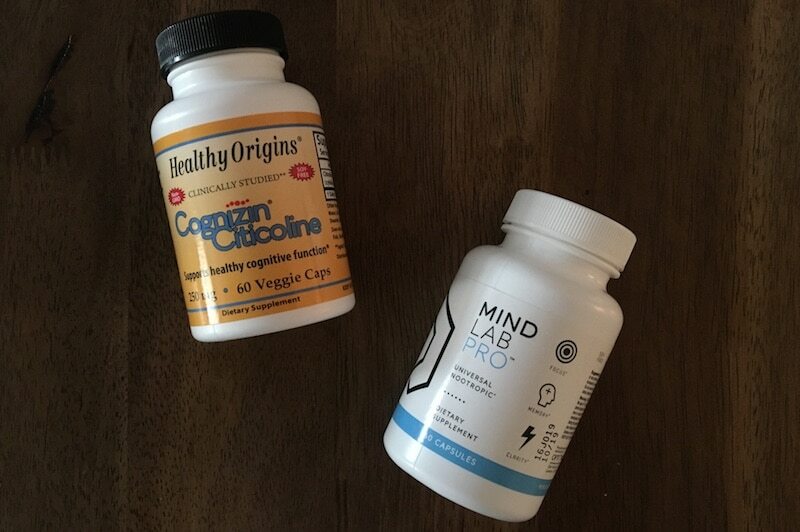 After taking Cognizin Citicoline for a few weeks, I noticed big improvements in my ability to focus and mental energy during my workday – even when jumping around from project to project. *These statements have not been evaluated by the Food and Drug Administration. This product is not intended to diagnose, treat, cure, or prevent any disease. This is another Gmail add-on that has been a total game-changer for me when it comes to managing my inbox. Boomerang allows you to schedule emails ahead of time, which means I can write emails days or weeks in advance – when I’m thinking about something – then just schedule them to send when I need them too. With this add-on, you can also set reminders to follow-up after sending an important email. If the recipient hasn’t responded, or you want to remember to respond by a certain date, you can set it right within the email. Boomerang then sends it back to the top of your inbox at the set date and time. Genius! I keep a tight reign over my Google calendar, but until recently I wasn’t using it as wisely or productively as I should have been. 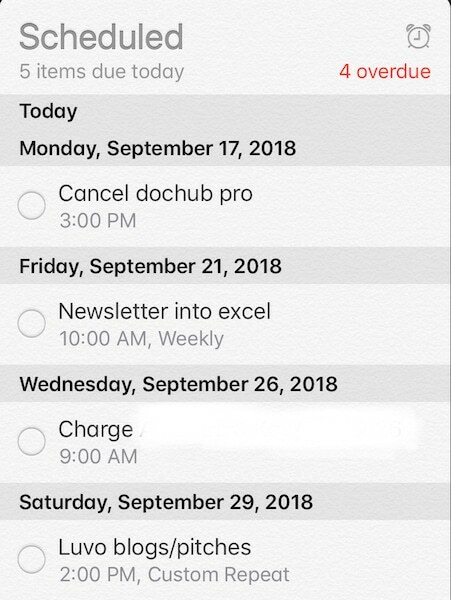 I used to put everything I needed to do on the calendar, even if it wasn’t something that had to happen at a specific time. My calendar got really cluttered up, which distracted me each time I looked down at it. I also missed many of my reminders that weren’t time-sensitive. Then I started using the iPhone Reminders app. I know put everything in there that is not time-specific, like remembering to check my client intuitive eating journals weekly, send blog post pitches monthly, or pay my quarterly taxes. I now only put things on my calendar that are date and time specific, freeing up some mental space and keeping me sane. With 100% of my work taking place on a computer or phone, it’s so easy to get distracted. A few minutes of Instagram here, a quick check on Facebook there…those minutes add up! Rescue Time runs in the background of your computer and analyzes your daily habits, telling you how much time you’ve spent on different websites or doing certain tasks. Seeing “Facebook: 3 hours” can be a huge wake-up call! It’s a super helpful tool to keep distraction to a minimum. Their detailed daily reports prompted me to make changes immediately. What tools do you use to stay focused and productive? I’m always looking for new ideas – please share with me below! I may try out rescue time. I’m currently juggling 1FT job and 2 PT jobs, an online class and my strength workouts to keep me grounded. I know I spend too much time onFB even though I cut back immensely. This could be a game changer for me while in nursing school. Thanks for sharing! It is super eyeopening to see the time you spend on certain websites. Highly recommend (they have a free version!). Sounds like you have a lot going on – nursing school, congratulations! I haven’t heard of this one, but I’ll have to check it out! Right now I’m still using a google doc to-do list, but I think I need to upgrade that soon. I *just* found out about (and am loving so far) Unroll.me (https://unroll.me/) This also helps with e-mail addiction (I suffer from it too!). From their website: “Instantly see a list of all your subscription emails. Unsubscribe easily from whatever you don’t want.” It takes a day or two to kick in, but really helps to streamline your inbox. I’ve been spending much less time reading email every day. I’ve also heard good things about music for focus from https://www.focusatwill.com/ but I believe it’s a subscription service. I’ve also found that music helps me with focus, and have done some research on music that boosts alpha brain waves. I made my own playlist on Spotify. If you like classical music, you’re welcome to give it a listen — anyone is (here’s a link): https://open.spotify.com/user/elamennelp/playlist/5cATrzvtGRULACby3DN6f3?si=aO0IazhoSoihKzM5ptjTaA I’ve also heard good things about music for focus from https://www.focusatwill.com/ but I believe it’s a subscription service. Thanks for sharing these resources Pamela!